Piston was brought into the clinic as a stray. The people that brought “her” in said “she” had literally wandered into their lives a few weeks before. They knew nothing about “her”, were unable to care for “her”, and were concerned that “she” was in labor and having difficulty having kittens. A physical exam with Dr. Brady revealed that “she” was actually a “he” and he was unable to urinate on his own due to bladder crystals blocking his urethra. This condition is fairly common in neutered male cats eating low quality foods. He had been up crying and straining all night because he needed to go to the bathroom and was unable to! His friends that brought him in were relieved to have an answer, but unable to keep him or commit to the investment and care needed for his long term recovery. Something about this fellow made Dr. Brady offer to take him in. The people he had adopted signed him over to Best Friends Animal Health Center. Piston spent a few days in the hospital on IV fluids and a urinary catheter in place. He was placed on antibiotics, pain medications, and a special diet to help break down the crystals. During this time he was a stellar patient and very loving despite his predicament. He earned himself a name and a special place in all of our hearts. Piston has still not made a full recovery, however, he has been doing very well. He will likely be on a special diet for the rest of his life to help decrease the chances of this happening again. 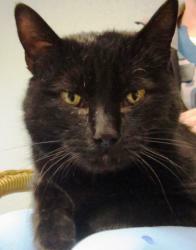 He is very affectionate, loves kids and laps, and seems to tolerate other cats. He doesn’t seem to be a huge fan of dogs, however, would probably adjust to them if they were kind to him. He is a very laid back little dude! Give us a call or stop by to meet him if you think you have a place in your home for this special guy. We would love for him to find a family he can call his own. Piston would like to remind you that if you feel your pet is unable to urinate that this is a true emergency situation. You should get them into a veterinarian immediately!